A 18-month, phase2B study on the safety and efficacy of Zimura (anti-C5 aptamer) in subjects with geographic atrophy secondary to dry age-related macular degeneration. A 2 year, phase 2 study on the safety and efficacy of Brimonidine Posterior Segment Drug Delivery System in Patients with geography atrophy secondary to age-related macular degeneration. A phase 1, open-label, single-dose, dose-escalation, and multiple-dose study of the safety, tolerability, pharmacokinetics, and immunogenicity of intravitreal injections of FHTR2163 in patients with geographic atrophy secondary to macular degeneration. A 1 year Phase 2 study examining a monoclonal antibody to decrease the amount of drusen in the eyes seen in people with Dry AMD with an intravenous infusion. A multicenter, open-label extension study to evaluate the long-term safety and tolerability of lampalizumab in patients with geographic atrophy secondary to age-related macular degeneration who have completed a roche-sponsored study. A 2 year investigator initiated study on prophylactic Ranibizumab for exudative age-related macular degeneration (AMD) in vulnerable eyes with Non exudative AMD Trial. 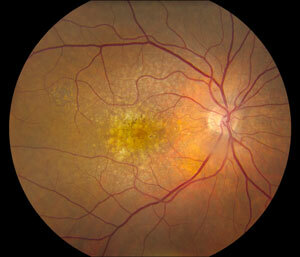 A 2 year Phase 2/3 study which aims to reduce the rate of Dry AMD progression with the use of an pill. A 2 year, phase 3, multicenter, randomized, double-masked, sham-controlled study to assess the efficacy and safety of Lampalizumab administered intravitreally to patients with Geographic Atrophy secondary to Age-Related Macular Degeneration. Non-interventional, cross-sectional study of Alu RNA measurement and complement factor genotyping of single nucleotide polymorphisms in the complement pathway in patients with geographic atrophy associated with dry age-related macular degeneration.